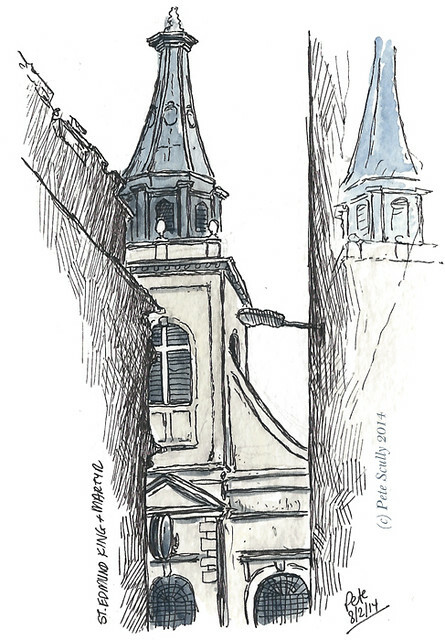 I decided recently that I would do a sketchcrawl in the City charting a course that could let me sketch as many Wren buildings as possible in one day. Not easy, and it would mean not getting super-detailed (I never got my big panorama), but if I invited other London sketchers, perhaps we could do it, perhaps we could cover them all. 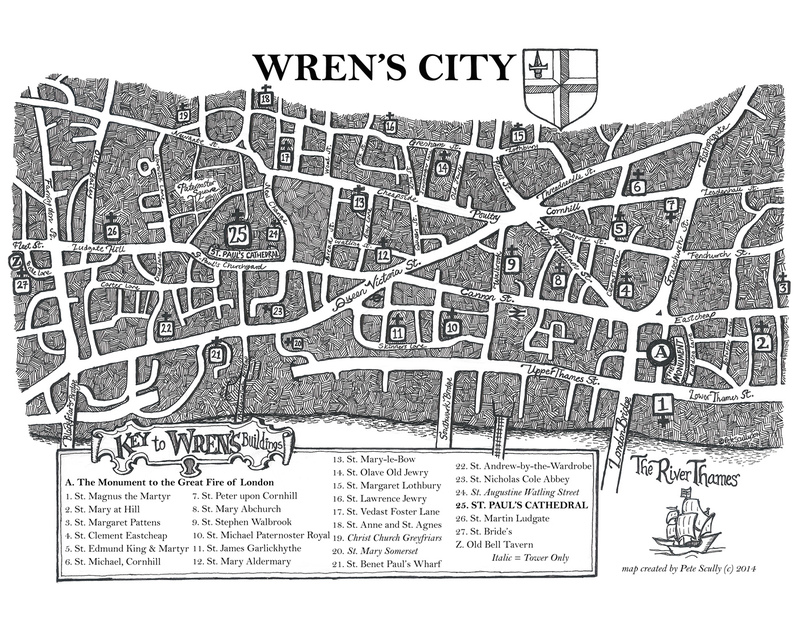 I created the map above (click on it for more detail) showing which Wren churches are left – there were more originally, but Father Time and the Luftwaffe trimmed down the numbers somewhat. I gave this map to everyone, as we met up at the Monument, and off we went. 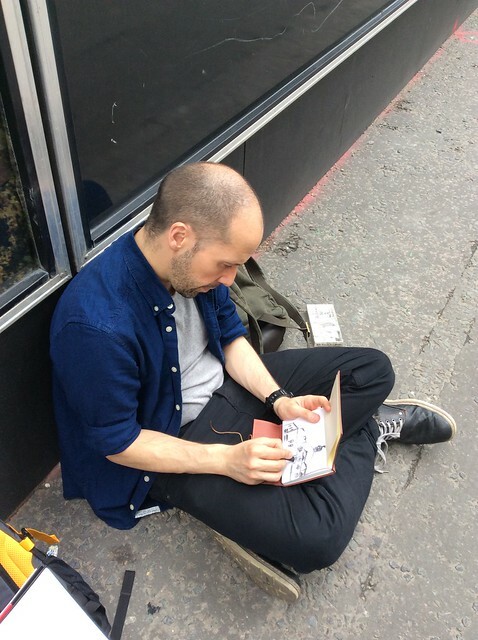 I love meeting London’s sketchers! We started out at The Monument to the Great Fire. Built by Wren and topped with a blazing golden ball, if it fell over it would rest exactly where the fire started, which must have made the city planners a little nervous (“Likely to fall over is it then, Chris?”). When it was built it was the tallest column in the world. You can walk up the stairs to the top and look out over the ever-changing skyline. I sketched it quickly, with one of the newer skyscrapers in London behind it, I think it’s called the Cheesegrater, because all of London’s new tower blocks have to have some silly name or other. If the Monument were built now it’d probably be called the Bunsen Burner or something. 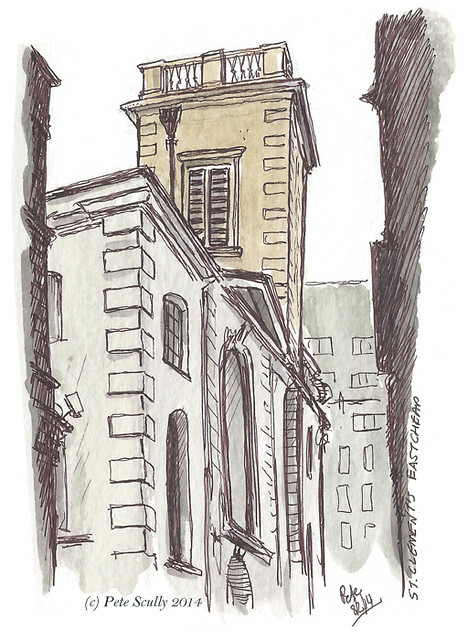 Here is my very quick sketch of the tower of St. Magnus the Martyr, just downhill from the Monument. I recall telling people on my old tours of London that this was London’s most haunted church, but I don’t recall why (probably something to do with ghosts). The bells were very loud and chimed for the longest time, as traffic belted by. St. Magnus used to be right on the River Thames, right by London Bridge itself, its clock being used by ships and bridge traffic for centuries, but as the embankments were built and bridges widened another building has now blocked its riverside view. I crossed over the busy traffic junction at King William Street and Cannon Street, and found the rather unassuming St. Clement’s Eastcheap. St. Clement’s…now where do you know that from, ah yes the famous song, “Oranges and Lemons”. This is the St.Clement’s of the song, not St.Clement Dane (the more famous one, located on Strand), and probably so alluded to because of the fruit cargoes offloaded from the riverboats nearby. Or maybe just because it kind of rhymes with lemons. I sketched in an alleyway. 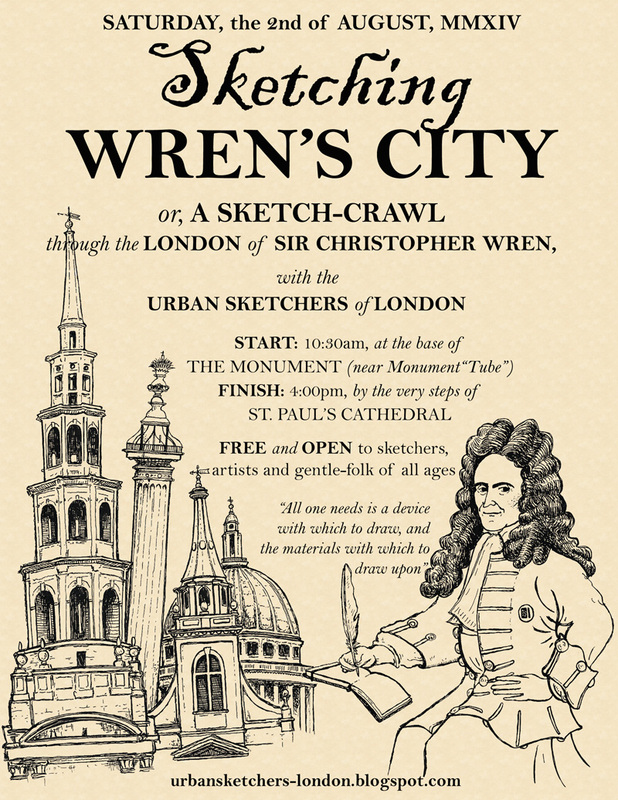 It’s not one of the more interesting pieces of Wren architecture. In fact it’s almost as though he couldn’t be bothered at all. “Oranges and lemons, do me a favour, I’ve got fifty-odd churches and a bunsen burner to build,” he was reported to have said, before designing the more handsome and dashing St. Clement Dane. This one is the forgotten little brother. Further down that same alleyway I found the church of St.Edmund, King and Martyr. A lot of Martyrs around here. I have a joke for you, what is King Edmund’s favourite sauce? Martyr Ketchup! … Anyway, as you can see I attempted to draw the reflection in one of the shiny buildings, so I hope that’s obvious somehow. 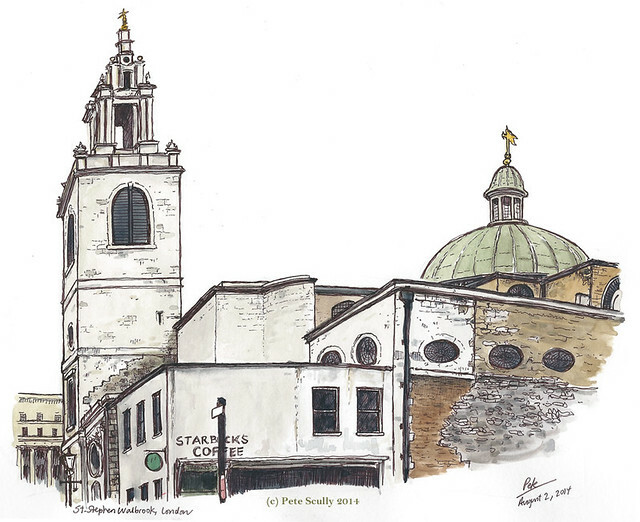 Standing on Lombard Street, in the shadow of mightier structures, St. Edmund’s is no longer a practicing parish church but is home to the London Centre for Spirituality. I met my good friend Simon (seen below sketching in messy charcoal), the actor and TV Tsar (no really, watch Houdini on the History Channel this week, he plays the Russian Tsar) and my friend Tamara (herself a stage director and playwright), out sketching with her family, and we sketched the wonderful domed church of St. Stephen Walbrook, one of Wren’s most beautiful churches. Oh, on the inside that is. It was closed this day (doh!) so we made do with sketching its wonderful exterior, Starbucks and all. Still, it was very nice to catch up with old friends and do some sketching. St. Stephen Walbrook by the way was Wren’s dummy-run for St. Paul’s (spoiler alert for part two, St. Paul’s is domed as well) and the inside truly is a delight to behold, ok it’s not the Aya Sophia or anything but it’s still lovely. You’ll have to just imagine it I’m afraid, or maybe I will just sketch it next time. 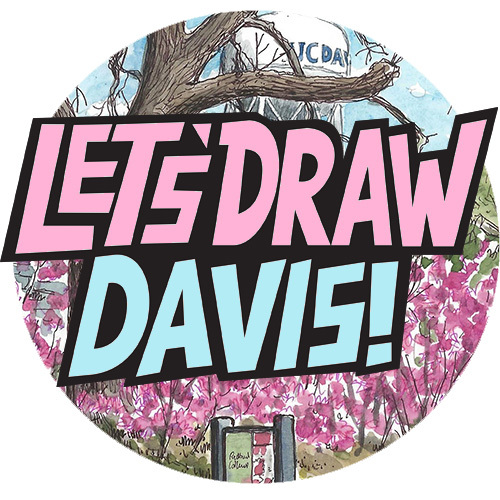 Absolutely wonderful sketches! I’m keeping the map for future reference as I might be back to England soon (I hope!). 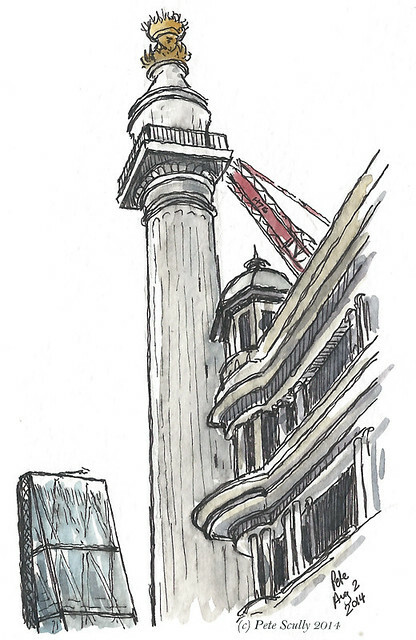 That was an interesting event to go through London sketching all those churches. I was unfamiliar with Christopher Wren until I saw an episode of Timescanners on PBS http://youtu.be/uSpfOenzSW8 where they investigated St. Paul Cathedral’s engineering and architecture. The challenges he faced on this one structure was staggering. I could only imagine the challenges for all the others. It was fun for sure. St. Paul’s was a particularly difficult endeavour, and it’s so much bigger and more important than the others. The rest of Wren’s City churches, I suspect, were kinda easy for him (except Stephen Walbrook, with its dome). Thanks again for organising this Pete. It was a great day (sorry I didn’t make the end).